Zipping. What a wonderful horse! Won this race four times straight, from 2007 to 2010. 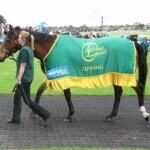 I seem to remember the first time I backed him was in a race at Flemington where there were two hot favourites. Maybe he came in second. All I remember is that I got over $5.00 for the place in a five-horse field! He still looks good, with that odd white sock. 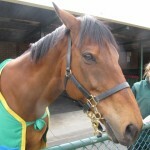 I backed Spilllway who looked very smart in the yard. All the form experts told me that it wouldn’t get the trip, but I don’t do form. The horse loomed up and looked more than likely, but suddenly realised it couldn’t get the trip. Fourth. A losing day. Well, the dust has settled now. What a rotten week! Two horses dead and another international winner! 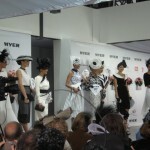 The Melbourne Cup is no longer the Melbourne Cup! I’m an Australian and I love the Cup, but the world, it is changing. It is no longer our Cup. It is the World Cup. Do you remember Drum Taps? The much touted European champion who finished ninth behind Vintage Crop, 21 years ago, the official start of the international invasion. In those days the overseas horses were quarantined out at Sandown and then on race day hidden in stalls behind a cypress hedge. We used to clamber onto hijacked seats to try and get a squiz at them. And how we loved criticising the hopeless tactics of the international jockeys. And now? A whole racetrack, Werribee, is given over to the overseas horses and their every whim! 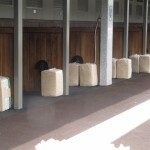 And on race day a whole row of stalls is commandeered, on clear view, with straw or “screened and dust extracted wood shavings” available for comfort. And even the international jockeys seem to be getting a bit smarter. The world is certainly a lot smaller now. Just think, when Vintage Crop won in 1993 the Internet had barely been invented. I spent several hours looking at all the World Cup horses in their stall. 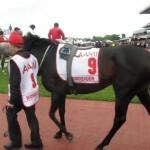 The favourite, Admire Ratki, as previously discussed on Caulfield Cup day, was too aroused for my taste. There were two standouts – Red Cadeaux and Protectionist. Red Cadeaux, the nine-year-old warrior, Persian Punch reincarnated, looked asleep. His head nearly touched the ground. In fact, I even caught him yawning! 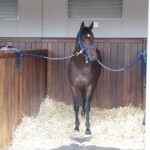 Protectionist looked perfect, relaxed, but keen and alert, ready to go. I had to pick between the two for my place bet and went for Protectionist, mainly because I’d backed Red Cadeaux in 2012, the only year he missed a place, and I was still spewy on him. Ouch! $5.00 versus $3.10 for the place! And I always take a cup trifecta. My final six were Fawkner, Red Cadeaux, Protectionist, Junoob, Willing Foe, Lucia Valentina and Signoff. I couldn’t come at Who Shot The Barman, who was weaving in his stall, had the cross-over noseband, and was taken out early onto the track by the clerk. And despite backing the Cup winner for the place I lost on the day with two other losing bets in the mares’ races. And some Cup Day trivia. 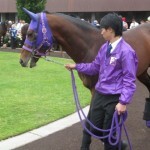 Five plates were lost from four horses during the race. Make of that what you will. The Oaks was better with two placed horses, Grey Spectre and Tashbeeh, and on Stakes day Terravista was a stunning standout. And I see Mick Burles, trainer of the people’s horse, The Cleaner, is still on the smokes. Final score for the week was seven out of eleven place bets and one losing trifecta. So, seven out of twelve. Not too bad. The greatest day of racing on earth. But the forecast is for Armageddon with rain, showers and hail. I decide to leave my lost and found hat at home in case the wind decides to blow it back to Frankston. It’s black and white day for ladies. Even the young lasses stick to the dress code of their mothers! There’s a freezing cold wind but 90,244 juiced-up punters don’t seem to mind. Two bets for two collects. Happy Trails looked absolutely perfect before the Mackinnon and Bondeiger was easily the most relaxed horse in the Derby.